Wholesale Growers of Specimen Trees & Palms - Jimenez Nursery, Inc.
enchanting, beautiful, and functional environments. many of which are unique, field-grown specimens. and creating breathtaking environments for our clients. Over the years our family business has grown, becoming officially incorporated in 1994, and moving to our current location in 2003. Today we employ over 150 people and maintain a fleet of trucks and our own cranes. 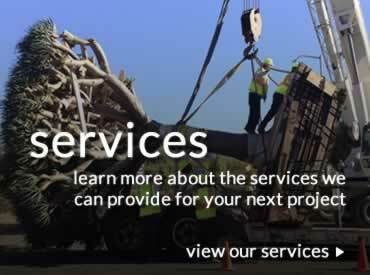 We carefully deliver our specimen trees throughout California. 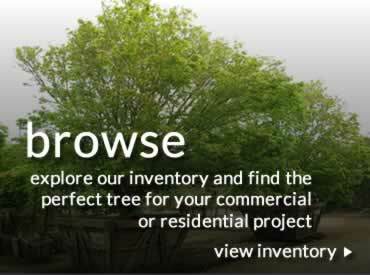 We are a wholesale nursery providing unique, one of a kind specimen trees; and serving landscape contractors, landscape architects, and general contractors. Jimenez Nursery is a wholesale tree grower and wholesale plant supplier based in beautiful Carpinteria, California. Our mild coastal climate allows us to grow a wide selection of specimen trees and landscaping shrubs ranging from drought tolerant plants to shade loving plants. Whether you’re looking for Oak trees or Olive trees, Aloes or Agaves, Palms, Ferns or Japanese Maples, we pride ourselves on our large variety of unique and exotic plants to make your landscape project outstanding. Our wholesale tree nursery specializes in large trees, 48″ boxes to 132” box size, but our passion doesn’t end there. Jimenez Nursery will help turn your landscaping ideas into a reality with our trusted landscaping services. We are the area’s premier supplier of landscape planning, tree removal and tree installation, landscape grading, drainage and irrigation installation, masonry construction and landscape maintenance. 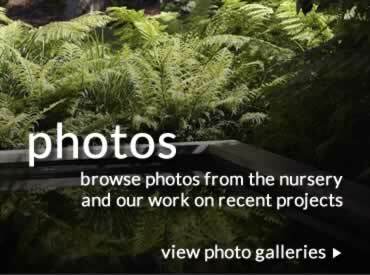 If you’d like to visit the nursery during the weekdays, please call (805)-684-7955.